This entry was posted on Tuesday, October 14th, 2008 at 8:20 am	and is filed under Artful Aging, Celiac & Gluten Intolerance, Gluten-Free Recipes, Nutrition Therapy, Seasonal Foods, Super Foods. You can follow any responses to this entry through the RSS 2.0 feed. You can leave a response, or trackback from your own site. Great post, Melissa! 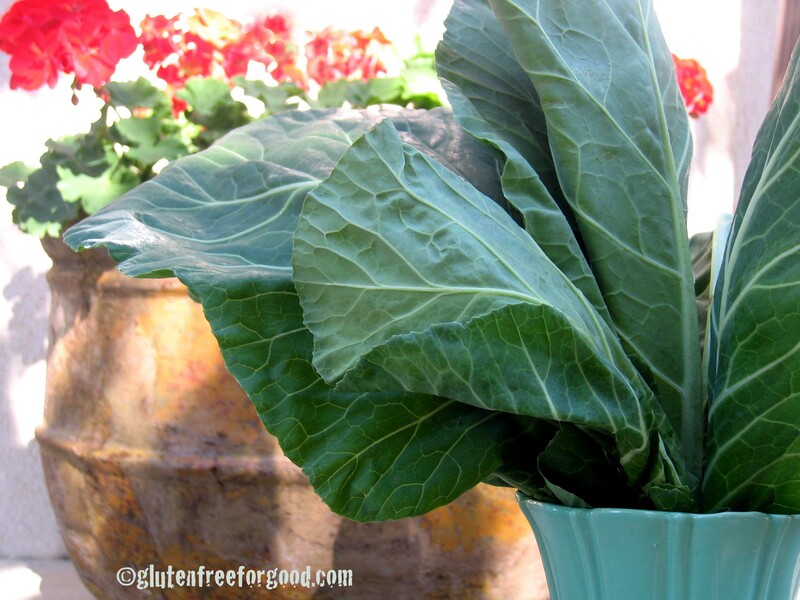 We love collard greens around our house — both for their flavor and nutritional value! Love your blog too… have been poking around all morning, and there’s some great stuff here. Love the photos- especially the rubber glove one! Cute! My bad, I have eaten collard greens in Brooklyn prepared by my adopted granny with lots of hamhock badness that tasted so good. Yum! A little ham is ok, eh? Someone else prepared them for me with smoked turkey necks instead as a healthier alternaive and they were quite tasty. Way to bring back collard greens! I ate collard greens almost every day when I lived in Mobile, AL and eat them almost every time I go to Karyn’s Cooked here in Chicago. They are so wonderful! Thanks for the comments, I appreciate it! You’re right, collard greens are flavorful and nutritious. Good stuff, for sure. Ham is okay. Actually, it’s really high in B vitamins. Hmmm? I’ve never had smoked turkey necks. I don’t think I’d seek those out, but I trust you that they’re tasty. Hey T — you’ll have to take me to Karyn’s Cooked some day. Michelle — my abundance of collard greens is from my CSA too. Just skip the beans with this recipe. It’s a “launching pad” recipe. One of those that you just make up and tweak accordingly! 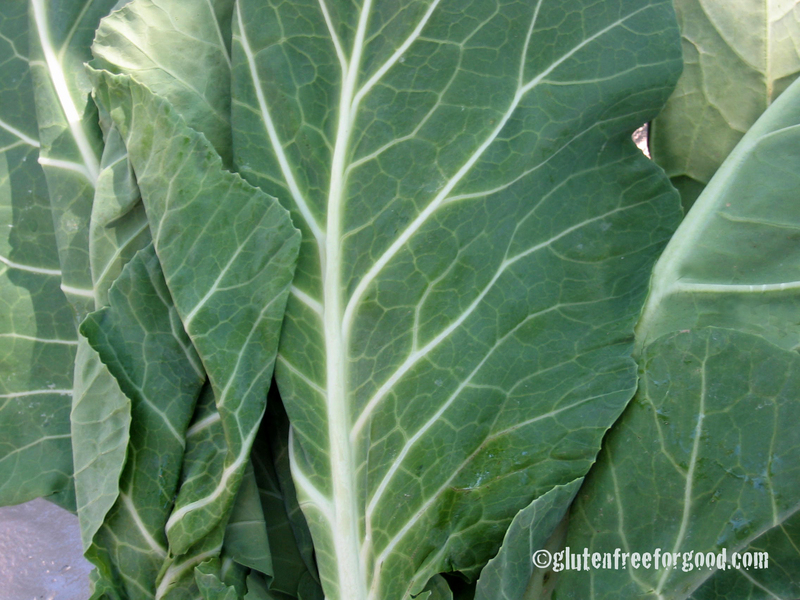 I rarely eat collard greens, they slow my thyroid (which went really bad during my vegetarian years), and my stomach doesn’t exactly love them, but for healthy people they are probably a good source of nutrition. Still, I sometimes eat broccoli and the likes, just because I like how they taste, but soy is something I never eat nowdays, because of my thyroid and because of a soy allergy developed during ten years of being a vegetarian. Do you know if cooking really destroys the goitrogens? There is so much different info about this and I am feeling confused about this subject. Yes, we have to figure out what works right for each of us. No soy for me either. And you’re so right, some (a lot) of the health and nutritional information about food is very confusing. I almost always lightly cook goitrogen foods just to be on the safe side because I eat so much of the stuff.